On nyarlathotep, my file server, I use ZFS with mirrored drives. If one drive fails, I have a reasonable chance of being able to power off the machine, get a replacement drive, and swap out the dead one; all before the remaining drive fails. But I had no monitoring or alerting, so I wouldn’t actually know if a drive failed, rendering the exercise somewhat pointless. I decided to set that up using Amazon SNS. 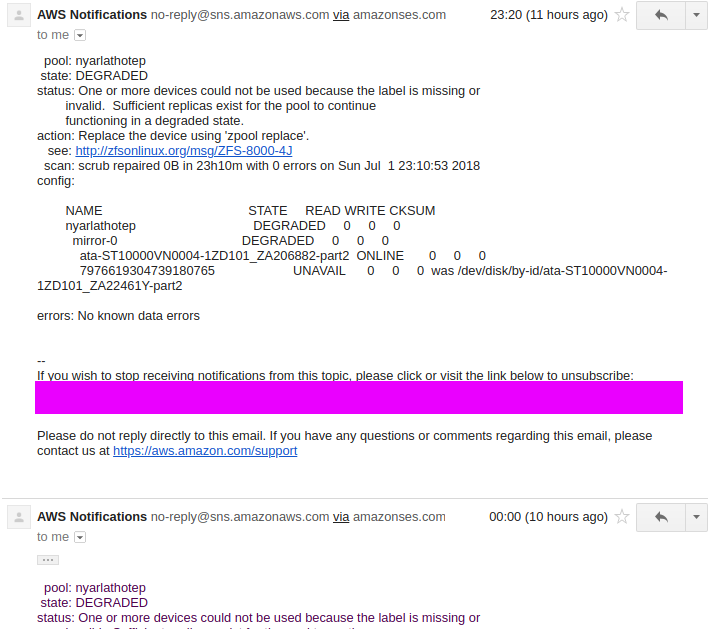 Amazon Simple Notification Service (SNS) lets you set up “topics”, subscribe to them through a variety of protocols (including SMS and email), and send a message to a topic by hitting a web endpoint. This seemed the simplest way to get my computer to text me. You’ll need an AWS account, and you’ll also need to be okay with SNS not being free. Fortunately, unless you’re going to be sending hundreds of notifications, it’s pretty cheap. Then you need to create an SNS topic and add subscribers to it, which you can do through the AWS web interface. "phone"      = "your phone number"
"access_key" = "your aws access key"
"secret_key" = "your aws secret key"
In my actual Terraform configuration, the phone number and keys are in a file which isn’t checked into the repository. Unfortunately Terraform can’t set up email subscriptions, as they need to be manually confirmed. So I had to set that up via the AWS web interface. You can send test messages through the AWS web interface, so try that to make sure everything is working. SNS exposes a web endpoint, so the “simplest” way to send a message to your topic would be to curl that. I decided to use the excellent boto3 library for Python instead. A script to push a message from stdin to a SNS topic. This is a nix-shell script, which fetches boto3 automatically when invoked. If you’re not a nix user, you’d do the usual virtualenv/source/pip dance. $ echo "Hello, world" | aws-sns -t "baz" -s "Test Message"
Now we have the alerting, so we just need the monitoring. Firstly we need a script to check whatever condition we care about (zpool status in my case), and to call the SNS script if it’s not good. zpool status | aws-sns -t "$ZFS_TOPIC_ARN" -s "zfs zpool status"
The only thing left to do was to test the whole set-up by simulating a hardware failure. I powered off nyarlathotep, unplugged a drive, and booted it back up again. I then ran the monitoring script directly, to ensure that it worked, and then waited until midnight (which was closer than noon, at the time I was doing this) to check that the timer worked.